Active8 Robots has been involved in manufacturing, supplying, and educating the robotics market since 2002. This ranges from small manufacturing companies to large multi-nationals, through to world-renowned research institutions. 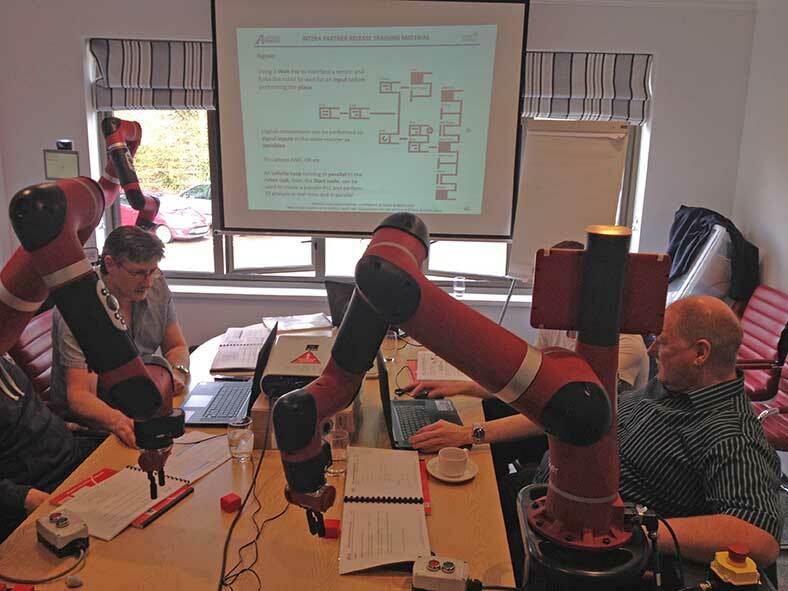 Our specialised robot training courses form part of our service that enables companies to embrace collaborative automation within their factories and allows our clients to maintain and expand the solutions we provide. Active8 Robots offers a wide range of automation focused development courses for every level to up-skill your staff. Whether this is a robot training course to get you up and running with a Rethink Robotics Smart Collaborative Robots (Cobots) or more advanced topics, this will ensure you get the most out of your robot. In addition to the manufacturing focused robot training courses, we offer more academic options ideal for universities and research institutions. So whether you are a researcher looking to use Sawyer as a development platform, or an educator using it to inspire and train the next generation of robotics engineers, we can give you the platform specific background to enable your research and teaching goals. We are offering several upcoming dates for training with Rethink Robotics’ Sawyer robot. “Great course and instructors” Alan Berriman, Technical Director, Mailway Packaging Solutions. Built on the open source Robot Operating System (ROS), the software development platform enables low level access to the robot. Introduction to the Sawyer software development platform. Setting up your workstation and communicating with the robot. A look into the inbuilt tools available to help you achieve your research goals, including motion recording, using torque readings etc. Using MoveIt visualisation to perform path planning and execution. An overview how the software development kit can be integrated with your research. “The training provided by Active Robots was of an excellent standard. The Engineer providing the training was clearly an expert in the field, with both an exceedingly solid academic background, and real-world experience of robotic systems engineering, and automation. The delivery was flexibly adapted to the diverse needs of the staff undertaking the training; (a mix of academic staff, and technical support staff). The training Engineer was extremely accommodating, polite, patient, and helpful, and was able to comprehensively answer all questions asked. We are looking forward to integrating our new robot into multiple taught units, across a range of our Engineering Degree Programmes, and we are also anticipating its use in some interesting Research Projects. – The general consensus from the staff at present is that the potential applications of this equipment are both vast, and exciting! We already have a queue of undergraduate and postgraduate students expressing interest in using the robot for a range of projects. If you are interested in finding our more about either our SDK training or our Intera Manufacturing training courses.